Six significant Beavers return for Craig Robinson this season, a group that will be called upon to quickly meld with four freshmen and a newly eligible transfer. Below we’ll break down those returnees in order of their per-game scoring averages last season. Devon Collier, Junior, Forward (13.1 PPG, 5.9 RPG, 1.3 BPG) – Collier graduated from starting all but seven games as a freshman to all but just three as a sophomore. His scoring totals nearly doubled in 2011-12, going from 7.0 PPG to 13.1 PPG. He was by far the team’s best scoring option in the post, and at times when Jared Cunningham couldn’t find his jumper, the best option, period. The next step on the road to becoming an all-conference performer is to finish more of his opportunities off the glass. That should come as he makes the transition to an upperclassman, and he already showed some improvement in the Beavers first European Tour game, going six-for-six from the field against Saint Charles Basketball Club. If he can continue anywhere near that kind of production, he has a solid passer in Ahmad Starks to get him the ball on the block. Collier can also run the court and is a great dump-off option in transition. On the other end of the court, Collier’s defense will be just as important to Oregon State’s success this season. The combination of Eric Moreland and Collier’s long wingspans made it nearly impossible for opponents to have any success in the lane, with Devon himself having one four-block game and three three-block outings. Ahmad Starks, Junior, Point Guard (12.1 PPG, 2.3 RPG) – Along with Collier, Starks is the only other player from Robinson’s 2010 freshman class still with the team. Starks is a shoot-first point guard, the best of his kind in the Pac-12. Despite only standing a generous 5’9″, he is able to get up and make shots consistently with his unique fadeaway jumper. 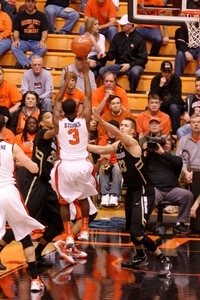 Starks was the main reason for Oregon State’s late success in 2011-12, as the Beavers went 6-2 in their final eight games. With Cunningham struggling to put down his three-point shot, Starks averaged 11.3 PPG in the seven games he played during that stretch. Not surprisingly, Oregon State’s two losses came in games where Starks scored only four points or sat out. The guard is at his best when he catches the ball on a wing or is able to create separation by stopping on a dime, pulling up, fading away, and shooting. More of this, and less of the jacking up random shots outside of the offensive flow, will result for more offensive production for both Starks and the Beavers. Last year the Beavers only had one senior on the roster, seemingly ensuring that the 2012-13 roster would be made up of the same guys. But one early entry to the NBA and two transfers later, Craig Robinson is indeed losing four players from last year’s squad. Below we’ll break down those four players in roughly the order of the degree to which they’ll be missed. Jared Cunningham – Despite earning offers from basketball powerhouses San Diego State and California (among others), Cunningham decided to leave his home state and go north to Corvallis. Three years later, he leaves as arguably the most talented player to don a Beaver uniform since Corey Benjamin’s single season in 1997-98. Cunningham instantly played major minutes as a freshman, and by the end of the season was starting regularly and scoring in double figures. As a sophomore, with Seth Tarver graduating, his role and production increased. He started 29 of the 30 games he played in, missing only the third-to-last game of the year for reportedly blowing curfew. That year was when people nationally began to take notice of the athletic shooting guard at OSU. Cunningham averaged 14.2 PPG and 2.8 SPG as a sophomore, and had the top dunk of the year in a game against Arizona. Last season, he led the Beavers to 21 wins with 17.9 PPG and 2.5 SPG. At the end of the year, Cunningham announced he was leaving early for the NBA, a decision that raised some eyebrows around town. Sure enough, however, he was drafted in the 1st Round by the Dallas Mavericks last June. Kevin McShane – After grey-shirting the 2007-08 season at Clackamas Community College, McShane had a rough start to his Oregon State career. The walk-on forward overslept for the first two 5:00 AM practices of the 2008-09 season, which left new head coach Craig Robinson wondering if he even deserved a walk-on spot with the team. But McShane impressed the coaching staff with his work ethic and hustle, making him a fan favorite whenever he entered the game. The years rolled by with McShane only playing garbage minutes or the not-so-rare instance when Gill Coliseum was so sleepy, Robinson decided to throw him into the mix just to liven things up. With an open scholarship available, McShane was the first in line to get one during his senior season. 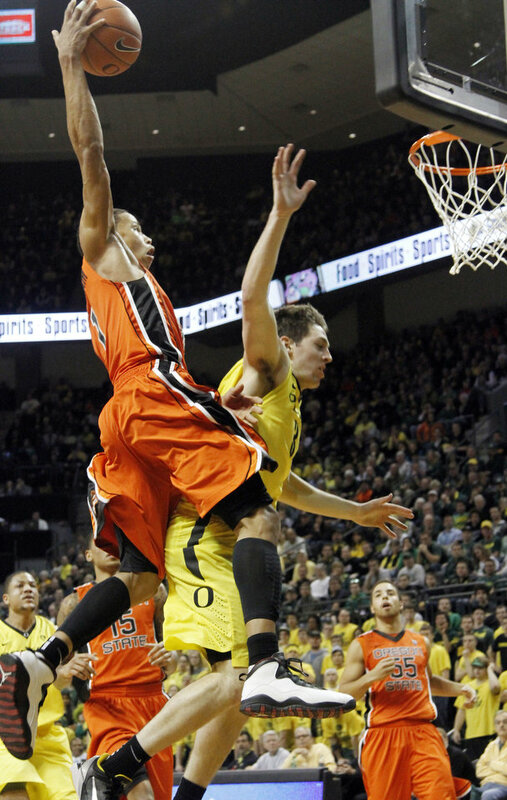 He responded by averaging 1.6 PPG, the highest total of his Oregon State career. Since the last Pac-12 Morning Five, we only had two games featuring conference teams. In the biggest of those, California got straight embarrassed by UNLV on Friday afternoon. After toying with the Bears for seven minutes or so, the Runnin’ Rebels ripped off a 31-12 run to end the first half, took a 20-point lead to the locker room and never looked back from there. Justin Cobbs had 20 points in the game, but the other three Golden Bear guards who started the game combined to shoot 8-of-31, turn the ball over nine times and just generally get outclassed by the UNLV guards, leaving Cal with wins over Denver and Georgia as their non-conference highlights. Meanwhile, Friday evening, UCLA knocked off Richmond for its fifth straight win and its best win of its non-conference stretch. In short, neither of these teams – both of whom were considered Pac-12 favorites prior to the season – should count on being able to earn an at-large NCAA Tournament bid barring a spectacular run in the Pac-12 season. With non-conference play all but over (three non-conference games of marginal interest remain) and conference play on the doorstep, Percy Allen at The Seattle Times handed out his awards for the non-conference season, with Jared Cunningham taking down the Player of the Year award, Tony Wroten the Freshman of the Year, and Johnny Dawkins the Coach of the Year. No real surprises there, but we’ll have our own choices up tomorrow with which to compare these. Looking ahead to the conference season, this may be obvious, but the chase for the title is completely up for grabs. Teams like UCLA, California, Arizona and Washington – considered prior to the season to be the four teams who would have the best chance at a Pac-12 title – all faltered to one degree or another in non-conference play. Oregon State and Stanford, middle-of-the-pack teams in the preseason, have impressed thus far, while Oregon, Washington State and even Colorado have shown some reasons for optimism. While this is admittedly not a great conference by a long shot, it could still be a great race for the title this year. Oregon State sophomore center Chris Brown announced at the end of last week that he would be leaving the program and transferring elsewhere. If you were among those who were unaware that somebody named Chris Brown played for Oregon State, don’t beat yourself up: Brown played a total of 38 minutes last season and had yet to see the court this year, despite several games in which the Beavers blew out their opponents. Lastly, an interesting piece on coaches who use some advanced statistics to help analyze their team’s performances, with Arizona State head coach Herb Sendek getting special attention. Sendek likes to chart things such as defensive deflections and defensive efficiency in the last 10 seconds of the shot clock as a way of improving his team’s performance. ASU found earlier in the year that teams were scoring against them 57% of the time that they took the shot clock inside of 10 seconds, and since that time Sendek has been emphasizing the importance of defending opponents for an entire 35 seconds.